Model Kim (B90 – W72 – H104 height 1.80m) wears a size XS. New collection! 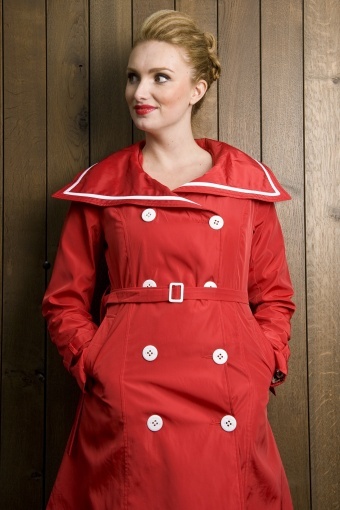 The Susie Raincoat red sailor from Collectif. From now on you will just love the rain because this stylish raincoat is fantastic! Classic trenchcoat with a playful navy theme: wide collar, white piping and double breasted white anchor buttons. Bust is fitted with a wider a line, the belt will emphasize your waist. Made of semi shiny repellent and windproof fabric. Even the lining is cute: an edgy leopard print! This rainjacket is a must-have for all ladies who live in a rainy country! Let it rain! Joepie,vandaag mijn red trenchcoat ontvangen.Ben er erg content over. Super en zo mooi verpakt.